Not surprisingly, when current society members are asked the question: "Do you wish you had gotten involved in barbershop singing earlier in your life? ", the answer is invariably (and emphatically) YES! • Fellowship - Male companionship in a wholesome family-like environment is conducive to friendship and the establishment of bonds that can last a lifetime. Members enjoy that unique sense of belonging that comes from shared positive experiences and team membership. • Challenge - Singing well is perhaps its own reward, but singing well enough to wow an audience is something really special. If you think you're too old for performing…try singing. A word of caution: standing ovations can be addictive! • Performing - Music reaches the human spirit in a way that words and pictures never can. Watching that happen to an audience as you perform a spirited "up tune" or a moving love song is nearly as addictive as winning a gold medal. How long has it been since YOU received a standing ovation? 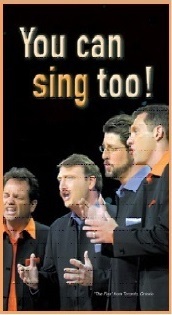 • Learning/Teaching - Mastering the intricacies of four-part a cappella harmony in an environment conducive to learning helps our members stay young and mentally alert. And speaking of youth, the chorus actively promotes the teaching of this unique musical style in local schools through our "Young Men in Harmony" program. Never too young (or old) to learn is our motto.